Reinventing the trash can. We use machine learning to filter out disposed items automatically into the proper bins! Hey you! Do you ever walk down the street, see potato chip bags littered on the floor, water bottles scrunched up every which way? Sure, there might be trash cans around and maybe you'll find one of those rare environmental enthusiasts somewhere, but for a large majority of society, sometimes it's just too much work. Plastic? Recyclables? Metals? Is this biodegradable or compost or can I just toss it into trash and it'll magically disappear into an abyss where discarded things go? Yup, paying attention and sorting out trash can take quite the brain power, which is why we bring to you today...DeepTrash! Because at MakeHarvard we believe in the motto of Veritrash, so you can throw anything into our DeepTrash bin, we'll determine the truth behind what trash category it is, and we'll automatically filter it for you! tl;dr - It's a trashy idea. Ok but for real, we essentially designed a smart, trash idea. 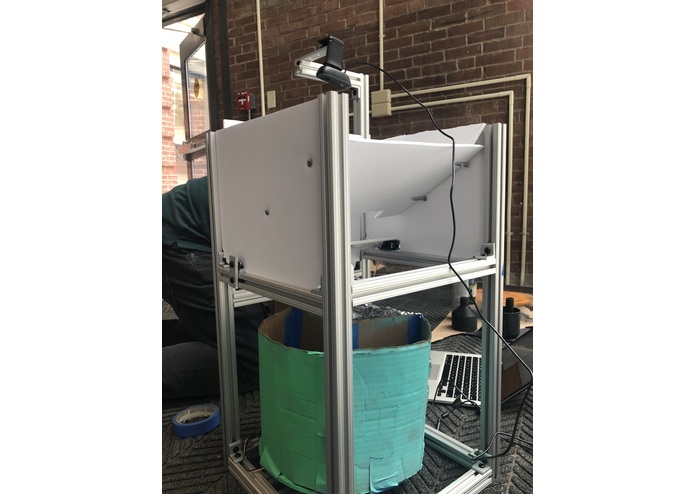 Our DeepTrash prototype allows for objects to be thrown into the top, rests on a platform where we use a webcam and machine learning to determine what item it is, the bins below rotate so that the correct bin is underneath, and then the trash is deposited into position. Meet our team of crazy, creative, and trash-pun loving college students! Bill and Grace worked on hacking the hardware, which includes assembling the trash bin framework, laser cutting acrylic pieces, drilling holes into foam (and not our fingers), and getting burned by hot glue guns. Raziq was our lead electrical engineer, working with the servo motors to control the rotating bins, linking up the arduino and electronics, and configuring flips in the upper platform. 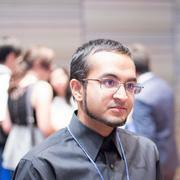 Lastly we have Isaiah, a machine learning pro who developed the software, programmed the machine learning algorithms, and trained our little garbage bin to detect different items and sort them according to only the best of sustainability practices! Wait, there's no Ctrl-Z button for hardware? You mean to tell me that we can't undo the hot glue gunning and epoxy action? It's not ideal because that means when we have better design ideas, it's hard to backtrace our previous steps and make it better. Well, that's the nature of hackathons, no? Not having enough data and time to teach our DeepTrash everything. Did you know that machine learning actually takes so. much. data? Data scientists have it hard, there's actually a lot of complicated statistics and formulas needed to accurately detect items in a quick manner. A garbage can can't learn in a day, you feel? Sometimes, life is just about waiting. There are only so many machines in the Active learning labs and with so many teams on the grind for projects, unfortunately there were some ideas like 3D printing pieces and laser cutting that we had to scrap. So sure, expect some jankiness from our project, it gives DeepTrash more character and portrays the realism of life. For us four founders of DeepTrash, with eclectic skills and way too many inside trash jokes between us, we are so proud of the product we developed. Making our DeepTrash prototype taught us all so much and allowed us to teach each other new skills: designing machine learning algorithms, working together in the machine shop, and training our device to recognize unique items. We're also proud to have created a very practical device that has a widespread, real-world application to enforce better green sustainability practices. All in all, we really just wanted to create an innovative, problem-solving device that could better the world and make a difference, and we know this is the start of something big. First and foremost, there is so much involved in hacking a hardware device! We learned how to better apply our individual strengths towards different tasks, integrate the software and hardware on a time crunch, and just find efficient alternatives when things got hard. So being resourceful was key to this whole project! DeepTrash is only going to dive deeper into the depths of the garbage world! Over time, we'd love to work on more sophisticated sorting algorithms, refine the hardware for our device, and make our product ultra-affordable and accessible to people around the world. These DeepTrash bins would be an amazing addition to public spaces, providing ease of recycling and enabling us all to take better care of our environment. I worked on the electronics and Arduino! Nanobiotech girl studying new materials and flying high-altitude balloons at Stanford!